«Homeland of Beatles» – this is the only thing Tasha knew about Liverpool before today, may be also something about football club. But Yuliya have already been here and never got tired to repeat that it is her favorite city in England! It was impossible not to visit it after such advertising as far as Chester where we stayed was only 30 km away from Liverpool. But first of all we have to make an important thing. To cure Yuliya’s tooth which was mostly damaged in our small mountain crash. And we went to the small local stomatology. You have to make an appointment in the state stomatology in advance. We certainly were in a hurry and went to the dentist on our first day in Chester early in the morning but an appointment could have been assigned only on the next day at 14.50. We were frustrated as we expected to be in Liverpool on the next day or at least on the way to and asked to inform us if some of the patients will cancel the appointment and earlier time will be available. And it worked! We got a call in one hour and were invited to come in the morning! First of all we got the small questionnaire about chronic diseases, allergies, alcohol or drug predilection =) We were waiting for ten minutes untiluntil the doctor would get free. They put Yuliya in the chair, light up with lamp, inspected the tooth and told us in details what was wrong and what they were going to do with it. The tooth got strong whack and partly cracked, partly broke off. But even though it looked like the wall of ruined fortress the most important was the fact that nothing was reeling and hurt and it meant that the nerve wasn’t damaged. Doctor refused to set permanent dental filling even though we asked to. The nerve could be easily damaged and could start to inflame with time. This was why doctor set temporal dental filling and asked to watch the tooth for couple weeks. If everything was ok it would be possible to set the permanent one. We got two packets of special toothpaste and all necessary documents for insurance company. It has to be highlighted: guys, don’t be lazy to make the insurance before your trip! It doesn’t cost much and you will be confident. Even though the emergency help for Yuliya was free of charge it doesn’t work like this in all countries. And temporal dental filling costed 60 pounds! All the cure process had taken not more than thirty minutes so we were cycling to Liverpool soon! Our route which was made by Google-maps was leading us mostly by the highway which went through lots of small towns. The bike path appeared on the roadside (in the cities) and disappeared again. The most interesting city was Bebington. Once upon a time the local lord founded here Lady Lever Museum in honor of his dead wife. Now it is one of the biggest collections of fine and applied arts in Britain. The entrance like in lots of English museums was free but we didn’t visit it as we were in a hurry to Liverpool! It was easy to hurry it felt like smooth and flat road pushed our bikes forward and the weather was nice and sunny! At about 16.30 we reached the tunnel which connected the city Birkenhead with Liverpool on the other side of the river Mersey.The transit was paid – 1,75. Free for bikes but…forbidden. It was allowed only after 8 pm when the stream of cars would subside. Polite cooperator of the transit booth recommended us to go around the corner and take a train. One stop to Liverpool costs 2-3 pounds. Nope. Thanks. How could we take a train when there was the ferry across broad waters of Mersey! Even though it was a little bit more expensive (we got ISIC-discount: 4 instead of 4,7) it worth it as we had a gorgeous view of Liverpool and wind in our ears! The price also included the pleasure of listening the song “Ferry’cross the Mersey” during departure/arrival and we arrived exactly at the city center to the Beatles’ souvenir shop and Albert-dock. Liverpool is big port and industrial center of England. Docks are his muscles, his soul and constant magnet for tourists. On the North of the city in the docks you can see only cranes, containers and industrial enterprises. The river keeps working and feeding the city. Whereas in the city center one of the oldest docks – Albert Dock – was reconstructed into beautiful place for walks and became one of the main attractions of the city. Nice boats and proud sailboats are swinging on the mirror surface of the dock’s water and multimedia and laser shows take place in the night. Most attractions of the city are placed in the nearby buildings: Tate Modern (the branch of London’s Tate Modern Gallery), Marine Museum Merseyside, The Betles history museum, International museum of slavery and different offices, shops, bars, restaurants. And at that moment something surprising happened – Yuliya lost her dental filling. Nope. We didn’t open beer bottles with teeth and didn’t eat any carrot. It just fell off even though it was set just a few hours ago. The dentist told us that it would be on its place for 3-4 weeks. “You can travel confidently it will last until you will come back to Russia”. 60 pounds were lost on the Liverpool roads and we are writing letters to stomatology as we want to get refund. Luckily the tooth doesn’t ache. But enough stories about teeth – we are in Liverpool! Liverpool museums are something really special. Everyone can find something special for him here. Marine museum with huge and incredibly interesting exhibition which is dedicated to the last hours of Titanic, Arts Museum, huge exhibitiondedicated to the slavery times. We strongly recommend everyone to visit Liverpool Cathedral to be more correct – its observation spot on the top. From the height of the biggest British Cathedral (5th in the world) spectacular view opens. The cathedral has unique bell tower which is the loudest in the worls. On the 7 bells of the tower the group of Liverpool bell-ringers perfomed John Lennon’s “Imagine”. Liverpool Chinatown is located from the South side of Cathedral. The entrance is 13-metres high arch decorated with hand-made dragons. The arch is the highest in the world among arches which are located out of China. It is said that Chinese live here since the end of 19th century. You can eat for reasonable prices in local restaurants, buy cheap sweets and drinks with aloe in shops. New modern building stands out of classical ones. It is museum of Liverpool which was founded in 2011. Exhibitions will give all information about history and development of the one of the most important cities of England. If you don’t want to spend money on The Beatles Museum here is the huge exhibition dedicated to the achievements of Liverpool four and entrance is free. World Museum Liverpool is also of a big interest. It has not only aquarium, interactive area which is dedicated to the natural history but also amazing research center. One of the features of the British museums (and Liverpool museums are not exception) is interactivity of museum pieces, you can touch almost everything. Even if it is an ancient exhibit for example mummy. Next to the mummy you will find a table where you can practice embalming. If the exhibition is about difficulties of slaves living you will have a chance to sit in the boat and try to use heavy paddles etc. This cute creature moves from one place in the city to another and have already 125 children decorated by designers in different parts of Liverpool. Yuliya had a ride on this yellow «Dockmarine» 2 years ago. All life moves to the Mathew street in the night. The famous club “The Cavern” where The Beatles performed 292 times is on this street! Every night live band plays Liverpool four hits here. The audience is singing loud and dancing till the morning! If you are in Liverpool don’t get confused. 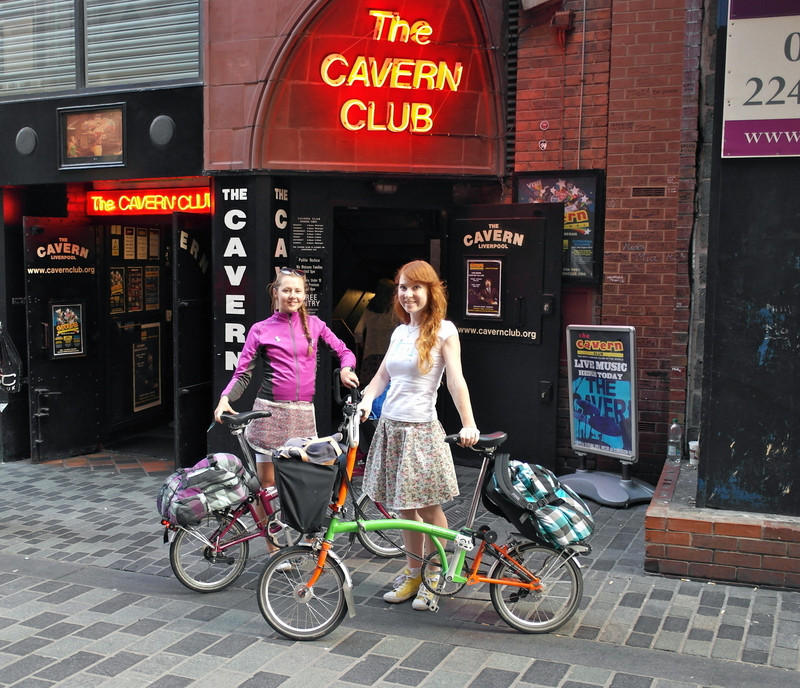 Opposite to the Cavern Club is the Cavern Pub which can not be proud of such musical history. We were lucky (according to our local friend) to catch rare nice day in Liverpool. We went with bikes on the hill Overtop to enjoy the sunset. It worth it! We stayed in the place of local bicycler with typical Liverpool name Ivan =) Big respect to Warmshowers.ru! We are sorry to spend such little time in such great city. But it is a big reason to coma back! This entry was posted in Blog and tagged bikeobritain. Bookmark the permalink. Great blogging! Really enjoy reading your idioms, and the photos too. Too bad about the tooth, don't let it ruin your trip. Liverpool = Disneyland of UK? Cheers.